Saturday was Avery's first horse show. She is doing Lead Line where they sit in the saddle by themselves and the horse is led around by someone. She was so excited! 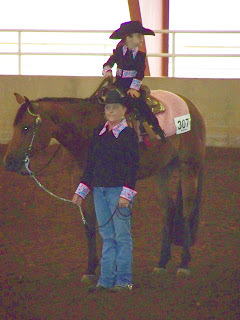 Ms. Heather has worked so hard with her getting her ready and teaching her how to ride a horse correctly. Avery sat on the horse like a natural and looked so cute riding it around the arena. She seemed so sure of herself. She looked so adorable in her black hat and outfit. I love her little chaps. She waved to us and waved to the judges. After all of the kids had been led around the arena twice, they lined them up and began calling places. Avery got FIRST PLACE out of seven. We were thrilled! What a great first horse show! All of the family was sitting on the swing (don't you wish you had a dollar for every time I mentioned the swing :). I was in the middle holding Addison up on my knees and her daddy and Avery were on either side of me. Every single one of us were trying to make her laugh. We were all making silly faces and talking that ridiculous baby talk. She was laughing and smiling so much. She kept looking back and forth at each one of us. We were all competing to see who could make her laugh the most. After a while it was like she was saying, "O.k., now show me whatcha got." We were all laughing - laughing at her, and laughing at each other! One of the MANY things that I love about Avery is that she loves to wear dresses, have her hair fixed, dress up in princess clothes, and have her toenails painted; AND she also loves to play outside, get dirty, ride the four wheeler, poke at worms, and ride her Barbie Jeep. She's a wonderful mix of girly girl and outdoor girl! 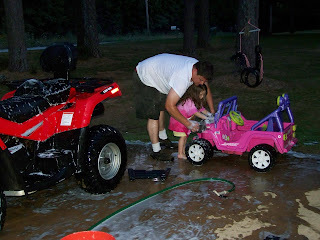 Last night, she decided to help her daddy wash the four wheeler. She really got a kick out of spraying the water and sticking her hands and arms WAY DOWN in the soapy bucket to get the wash rag. She decided that she her Barbie Jeep needed a cleaning too. By the time she was finished with the ATV and Jeep wash, she was soaked from head to toe! Today we went to see Snow White and the Seven Dwarfs at the ASU Fowler Center. On the way there I prayed that Addison would be good - awake or asleep. Whenver we got there, we had to wait to see if they were selling any more tickets. Thankfully, they were. I was kind of upset to find out that I had to pay for my almost 3 month old who was not even in a carseat that took up room, but in a sling that I was carrying her in. 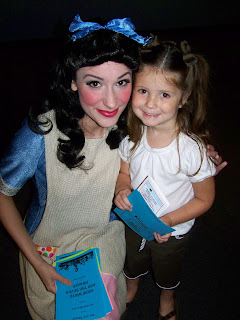 Anyway - before the play began, I took Avery's picture with Snow White and the Queen. The play didn't stick to original script, but we LOVED their version of the story! Avery's favorite part of the play was seeing the seven dwarfs. They were hilarious! My favorite part was the magic mirror. The way that they made the mirror look was amazing! We didn't get to find out what Addison's favorite thing about the play was because she was ASLEEP THE ENTIRE TIME! Thank you God! We all had a good time. 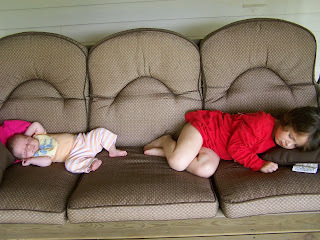 Oh, the joys of two children asleep at the same time! We are always on the go and stay so busy whenever we are at home. 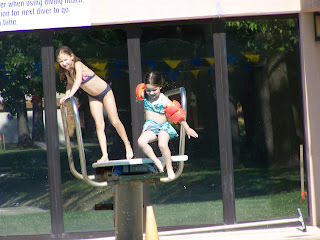 Our week consists of Mondays - major laundry day and just hanging out at home, Tuesdays - library time and then to eat with friends, Wednesdays - gymnastics, Thursdays - playdate with kids from church, Fridays - last Friday was pizza day and I hope this tradition continues! Whenever my precious little ones are asleep at the same time, this is my time to do extra cleaning (lucky me! ), make grocery lists, clean off the deck, do more laundry, straighten my girls' rooms, check e-mails, update blog, read a book or magazine, hunt for new recipes, talk on the phone, plan for supper, and sometimes, if I'm lucky, take a nap myself. ***For those of you that read our blog on a regular basis, the picture is of the very famous swing. Everyone who knows Avery is very aware of the fact that she loves horses - I mean REALLY LOVES HORSES! 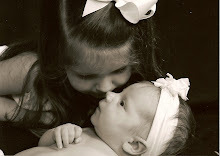 She began falling in love with them when she was about a year and a half old. She called them "hoewees." So, for her second birthday, her daddy arranged for horses to be brought to our house and give the kids rides. She was amazed! We recently cleaned out Avery's toybox and discovered 57 horses of various sizes and colors. Because her toybox is overflowing, we decided to buy her one of those large, plastic, drawered carts to go in her room - just for her horses. 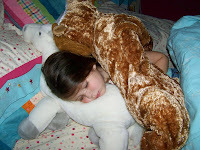 Those horses join her 15 stuffed horses, large Butterscotch Pony that moves, neighs snorts, swishes its tail, chews on a carrot and swishes its' tail, approximately 30 horse books, a large plastic horse about 2 feet tall, her horse bedspread and pillows, her fabulous horse mural on her wall, and her horse lamp. Everywhere we go, she points out horses. She absolutely loves them. She can never get enough! Today, we went to the library and they were having a Scholastic Book Fair. Guess what she found? Two horse books! She looked at them all the way home and was so excited to tell me about what the books had in them. Whenever I say something about going to someone's house that she doesn't know or if I tell her about someone new, she always asks, "Do they have horses?" Every once in a while, she will (out of the blue) say, "We really need a real live horse." We always agree with her. 1) He lets Avery paint his toenails (picture). 2) He will go to Wal-Mart, no matter how late it is, to get something that I should have remembered to get. Tonight, he went to get Infant Tylenol for Addison. She has her two month shots tomorrow. 3) He cleans better than I do. 4) He can create anything. We currently have a contraption on the bathroom light switch so that Avery can turn the light on and off. 5) He can fix anything - the washer, our vehicles, the lawn mower, my jewelry, a squeeky swing, etc. 6) He says the words, "What can I do to help?". 7) He gives me compliments all of the time. 8) He watches Grey's Anatomy with me. 9) He keeps a garden and works so hard in it so that we have wonderful fruit and vegetables that last all year long. 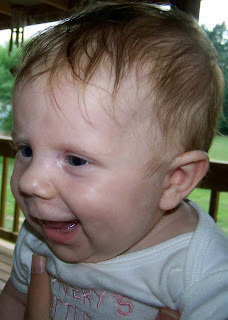 10) He makes me laugh and when he does, it seems like we are two giggly teenagers again.